Top engineering colleges of Aurangabad-Maharashtra are not just known for their top quality education, but also the best infrastructural facilities as well. Generally, colleges are ranked taking into consideration not just the academics angle, but many other factors inclusive of placement records are considered in ranking any higher education institution. Even though, it is stated that the quality of engineering education has reduced in the country as compared to what it was earlier, there are the best engineering colleges in Aurangabad-Maharashtra that follow strict admission procedures and choose only suitable candidates, who are competent enough to understand the concepts of engineering. We have tried our level best to cover maximum colleges providing and will keep trying to do so. 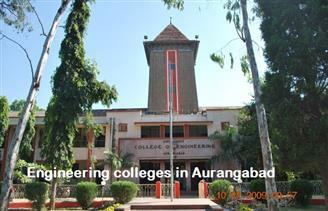 The best Engineering institutes in Aurangabad are covered here. If any Engineering institute in Aurangabad is missing in this list, kindly inform us using our Contact Form. Students studying in Engineering colleges in Aurangabad can also write reviews and feedback about their Institutes so that it will be guiding torch for other students. In this page you will get information regarding, fees strcuture, admission processs, placement details, Hostels fees, and other campus facilities of Engineering Colleges of Aurangabad.